If you make your living by betting people what the largest (by number of bricks) Lego structure is, then I’m sure you know that the record goes to a colossal X-Wing fighter, made from 5,335,200 bricks. Well, did go to. It’s time to revise your data, because Land Rover has beaten that X-Wing with a Lego Tower Bridge that’s the new World’s Largest. The Tower Bridge is made from 5,805,846 Lego bricks – enough for everyone in Norway to step on with a bare foot and start swearing, in Norwegian. 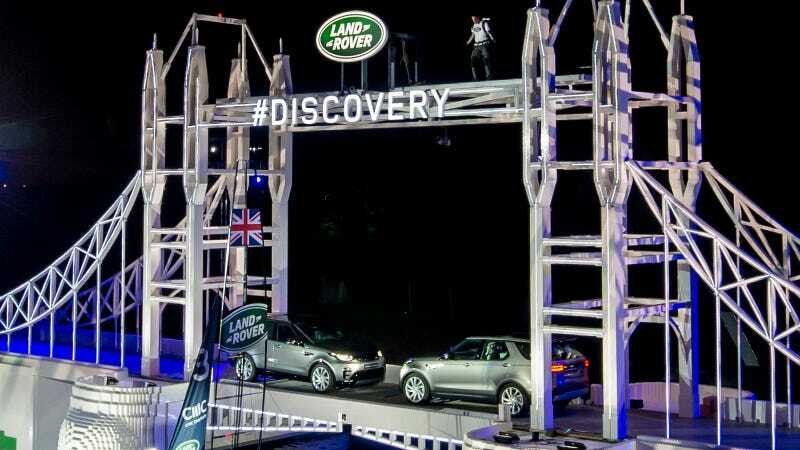 The 40-foot-high sculpture was commissioned by Land Rover as way to show off the new Land Rover Discovery and finally prove that they can build a car capable of driving over millions of tiny toys. The finale saw sailing Olympic gold medallist Sir Ben Ainslie drive the new SUV through 900mm-deep water under the bridge, while towing a LEGO replica of the Land Rover BAR boat, a 186,500-brick model of the boat that will challenge for next year’s America’s Cup. The reveal set was made from 5,805,846 individual LEGO bricks; breaking the previous Guinness World Record by 470,646 pieces. Laid end to end, the bricks would stretch for almost 200 miles, or from Tower Bridge in London to Paris. Led by the UK’s only LEGO Certified Professional, Duncan Titmarsh, it took five months for expert LEGO Master Builders in the UK to construct the incredible Tower Bridge structure. It was erected in the grounds of Packington Hall, Warwickshire, UK – close to the Land Rover plant in Solihull, where the all-new Discovery will be produced. The Lego bridge is officially a Guinness World Record holder now, so somebody better break the news to the guy who built that huge Lego X-Wing.